The value of friendships means so much to me, and the heartache of a divorce reinforced how important friends can be. After 30 years of what I thought was a strong marriage, my husband left me. I was devastated. My children, family, and friends were as shocked and hurt as I was. And it was their love that sustained me. At the time, I was the secretary at my church, and the concern and love the staff bestowed on me went far beyond friendship. In addition, many friends reached out to me. I had seven close friends in town who let me know I could call, and they always came to be with me. I knew my friends were sincere, and this meant so much. They didn’t just pay lip service to my needs, they followed up and contacted me every few days. One friend carpooled with me to work, and every day I cried. She cried too. I felt so sorry for her because she heard me drone on about the same disbelief and hurt day after day. But, she kept listening until I had no more tears to cry. It took months before the tears were traded for any sort of true contentment. Divorce is a painful and often isolating experience, but God provided support through so many friends. Each phone call, hug, dinner, and trip shared with my friends brought healing to my broken heart. If I did anything right, it was to embrace the love of others. When friends connected with me, I learned to say “Yes,” instead of “No,” or, “I don’t feel like it right now.” Looking back, I said “Yes” each time someone reached out. When the phone rang, I answered. When friends invited me to dinner or a movie, I always went. I never turned anyone down. Thinking about those days more than 30 years ago, I see much of my recovery came from those who surrounded me. And when others ask me for advice on how to handle a situation like mine, I encourage anyone not to isolate themselves. When we are at the bottom, we need a miracle. I found my miracle in friends, God’s gift to bring me through the darkest time of my life. We want to hear your story–tell us here. Like what you see at 1stFaith? Support us here. Find us on Facebook, Instagram (@Real1stFaith) . . . & Twitter, too. My wife and I had just moved to Atlanta so I could begin my first job out of college as an Engineer. She found a job teaching high school math. Life was good. It was time for us to start our life together. A new city to explore. New friends to make. However, a few months in, we sensed God leading us back to Nashville. At first we pushed the feeling down attributing it to home sickness, since we are both from the Nashville area. Why would God bless us with these terrific jobs only to call us to leave a few months in? However, the feeling wouldn’t go away and we started to get more confirmations. Finally, things came to a boiling point. Out of the blue, my wife received a job offer in Nashville. What do we do? Do we throw away common sense that says before we move I need a job as the main bread winner of the family? After a lot of prayer, we decided it was time for a leap of faith. My wife would accept the job. Since we needed my income, I would stay in Atlanta until I could find a job in Nashville. We knew this would be tough but we felt peace. It would be okay. The peace lasted until I said goodbye to my wife and dog, and was sitting in the apartment alone. I have never felt so alone in my life. What insane decision had we just committed to? I was 23 and had only been in my first post-college job for 3 months. Who would hire a recent graduate who left a job that quickly? As one month turned to two, my fears worsened. Is this what taking a leap of faith is supposed to feel like? Having faith was increasingly harder, especially because His time schedule was clearly different than ours. We started saying that maybe I should quit and move even though I hadn’t found anything. Finally, after three months, I got an interview. A few weeks later, the job–finally–came through. Better than that, we made it through. Looking back, I see the waiting put us in a better situation than we could have imagined. And we learned that the leaps God calls us to don’t always come with a pretty bow on top. Leaps, when they ask us to toss aside common sense, require patience and trust in the uncertain. However, if a leap is truly what God calls us to, we just put one foot in front of the other. Though His timing tests us, He opens doors, only requiring us to walk. Without that leap a little over three years ago, we might not have been a position to take another leap, which we call 1st Faith. FROM KIRK WALDEN, EDITOR: For regulars here, you know 1st Faith is where anyone has an opportunity to tell a story of faith. Why? Because one of the strongest ways to build a friend’s faith is through telling our own story. A story which captures me is the one of Jesus washing the disciples’ feet. It’s a story only mentioned once in the four gospels, but even today Christians focus on this moment’s significance and lessons. Clearly, this act was one of servanthood. Here is a king, washing his followers’ grimy, calloused feet. This doesn’t make my bucket list of “must do’s.” But it was for Jesus. Which creates a question. What is a modern-day equivalent of foot-washing? May I offer one, which I often overlook? In today’s world, we’re wedded to IPhones, Droids, laptops. We’re filled with social media. Any conversation is easily derailed by the distraction of a call, a “Let me just text him/her back really quickly” or a need to rush off to the next thing in our busy lives. Today, we don’t worry much about dirty feet. Still, our lives get messy. Sometimes, the only way to wash off our emotional dirt is to vent to a friend. Modern-day foot washing? Listening. Listening, really listening, matters. Our modern dirt pops up when we face the real-life challenge of living out our faith in a mixed-up world. When the wind and rain of circumstances hits us from all directions and we try to make sense of things, our spiritual feet get dirty. Our dirt may not be some sin, or a situation demanding a quick fix. It’s just stuff. Messy stuff. Jesus, on his final night, stopped. He took time to thoroughly wash each disciple’s feet. And we can be sure He listened to his friends as He carefully cleaned those feet which journeyed alongside him over three years. Sometimes, the best example of servanthood is two available ears. No judgment, no quick fixes, no pat answers. If we offer this gift, perhaps our friend will experience refreshing as the overwhelming circumstances of life wash away. And the feet our friend needs to walk this journey are once again clean, ready for the next step, wherever it leads. There’s a story which—at first glance—makes me look at Jesus and say, “What were you thinking?” It’s in Luke’s account (Ch. 8), the story of Jesus healing a demon-possessed man. A quick refresher. Jesus calms the sea, then when he and the disciples get to the other side, waiting for them is an absolute whack-job of a man with brutish, chain-breaking strength who terrorizes everyone. He’s naked as a jaybird, yelling at everyone. This makes sense, right? But incredibly, Jesus said, “No.” He sent the man away, telling him to return to his house and tell others what God—through Jesus–did for him. Today, it’s easy to focus on learning the right verses, or crafting the correct arguments to convince others to believe. It’s intimidating. Soon, we decide sharing our faith just isn’t our thing. But perhaps, all we need is our story. In the end, this guy went out and told “the whole city” what Jesus did for him. I bet people listened and a lot of hearts turned. The lesson? Our stories of faith encourage others, and can change lives. This platform—1stFaith—is for you, to tell stories. Here, we don’t ask only the perfect, or the smartest, to share stories. We want stories from real people living real life. Transparent people, like the man in Luke 8. Getting in the boat wasn’t for him. Because he had all he needed—his own story. Remember a time when your faith grew? Tell us at 1stFaith. Together, let’s change the world—with your story. In 2007, during my first year of marriage, I became incredibly ill. My body unleashed attacks upon itself as an autoimmune disease viciously assailed my pancreas, intestines and finally, my entire colon. In weeks, I went from years of barely experiencing more than a cold, to knowing medical specialists by first name. I found myself making repeated visits to the ICU during the second trimester of my first pregnancy. An extended hospital stay followed the birth of this baby boy. All of this while my husband was on deployment in Afghanistan. Eventually the Red Cross got involved, bringing my husband back to the States, quick and in a hurry, mid-deployment. I didn’t find out until later that my doctors weren’t sure I was going to make it. I was scared, pissed off, exhausted, worried. And so very sad. More than 10 years have now passed since that chapter in my life. Many of my friends are surprised to hear this is part of my story, because life is so amazingly different now. I’ve watched as God turned my fear into trust. In these 10 years He restored my health, healed my body, gave me two more healthy children, and strengthened my marriage through tremendous stress and financial burdens. And, God took my pity and showed me a life of thankfulness. These 10 years have been calendars full of miracles. And friends, I mean legit, medical professional head-scratching miracles. In 2007, the thought of 2017 was one of dread. Instead, it was a year of celebration. Now, I know how quickly life can change. Today, I look forward to the lessons and blessings each day brings. No matter where this moment or any other moment has taken you, whether low or scary or sad, hang in. Your story is still being written. When any of us hears these words, we know whatever is coming next is not good. Not. Good. The person speaking these words is either offended by something we did, or is ready to point out one of our flaws. Several years ago after one of my speaking engagements, a young man came up to me and said these very words. Of course, I said “Yes.” What are we supposed to say, anyway? So, I listened as he dissected one sentence of a 45-minute presentation and told me what I needed to change. I went back to my hotel room, thought about his words and realized he was incorrect. It’s important that we listen–and I did. But in this case, he wasn’t right. I make plenty of mistakes on stage (and I think about them a lot), but this wasn’t one of them. Over the years I’ve thought about this phrase and even made jokes about it. But, if I can be honest (see what I did there? ), the phrase “May I be honest with you” needs to disappear. There is an obvious reason why we need to junk this phrase; just saying it brings an implication that we are sometimes dishonest. If we must ask someone whether we can candidly talk with them about an issue, we’ve skipped a major step. Because before we can “be honest,” we must invest in another person, listening to our friend–a lot–over time. We know our friend’s flaws, and accept him or her as she is. We’ve allowed our friend to be real with us, without condemnation. And, we’ve been transparent ourselves. Those who want to jump in and be honest–almost always–have yet to do any of these things. They think it is important to “speak truth,” but do not grasp the importance of first speaking words of love, of commitment to the friendship, and of encouragement. And when we’ve yet to be transparent with another, our words of “honesty” come across as words of superiority. Why? If I am quick to point out another’s failing without sharing any of my own, I’m just another perfect person, trying to help another become like me. It’s empty. We’re exploring a 1st Faith here and “May I be Honest” is a key facet of finding the faith of the early Christians. Jesus could be honest with his followers, without asking permission. It’s a lesson for me. Many times, I’ve wanted to “just be honest” with someone–but it wasn’t my place. I had yet to earn true standing in that person’s life. If I want a true 1st Faith–the faith of the first followers–I’ll invest in a person deeply enough so that if difficult conversations are required, my listener will know I care about them more than I care about imparting what is “right” to them. It’s not a flat-out “no,” but it can open the door to an important conversation on what we must do before we are “honest” with another. Honesty is always important. But earning the right to speak matters, too. 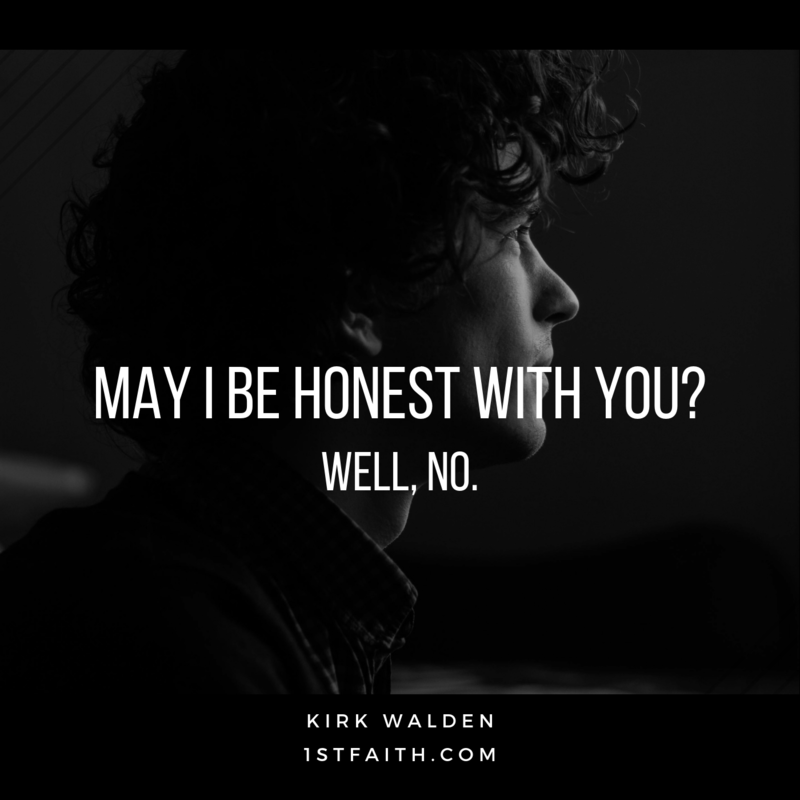 BY KIRK WALDEN– When we consider talking about our faith, we can be intimidated. I am, that’s for sure. So, we (I) wait. To avoid this uncomfortable truth about our own shortcomings, we do things to express our faith. We are great in groups, so we go to church and we participate in church projects. We even talk about our faith on social media. These are good, certainly. They are also relatively safe. But when it comes down to those one on one moments which aren’t easy, we’re reticent. We’re so reluctant to share our hope, experts on evangelism study us. One article out there tells us more than 90 percent of “Evangelistic Christians”–whatever that means–have never talked about faith to a next-door neighbor. It’s almost as if many of us have reached the point where we will share our faith . . . when pigs fly. That’s why you see the headline up there. 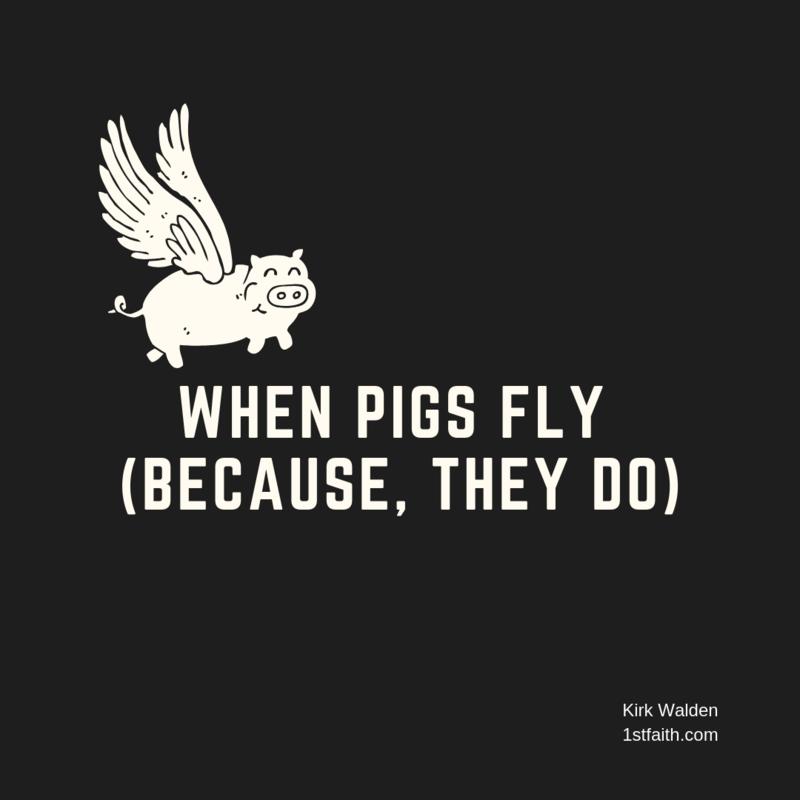 Because, I believe pigs fly. Or at least, it happened once. And it shows how easy it should be–can be–to talk about my faith. Allow me to explain, because you probably remember the story–though the “flying” part may not jump out at you. I’m here to help. It’s my superpower (I saw Incredibles 2 the other night and figured this out). Read on. Remember the narrative in the Book of Mark, where a man in the country of the Gerasenes is possessed by a legion of demons? It’s a joyful little tale of a raging maniac. Read it to your young children at night. Before bedtime. A quick refresher, before we get to the “pigs fly” stuff: Jesus stills a raging storm on the water in Mark 4. Reaching the other side of the sea in the 5th chapter of Mark, he enters the country of the Garasenes, a gentile (non-Jewish) community. Fresh off the boat, Jesus is confronted by this crazy, possessed man who breaks shackles meant to contain him and basically terrorizes the neighborhood. Just spit-balling here, but he probably didn’t get many invites to parties. The demons, making their home in the man, realize Jesus is the son of God. They don’t want to be destroyed, so they beg Jesus to toss them into a herd of pigs. Jesus agrees, the demons enter the pigs and they fly into the ocean, drowning themselves. Okay, the pigs’ flight is a short one. “Air Bacon” never took off as an airline. But, they flew! This is a stunning moment for everyone. Those in attendance, after seeing a miracle, asked Jesus to hit the road. Or, in this case, the water. Why? It’s likely because those pigs were valuable, and the Garasene people weren’t happy to see their livelihood tossed into the sea. As for the former demoniac, he asked to join Jesus in the boat. Wouldn’t any of us do the same? It only makes sense to follow the one who changed our life, right? And, it would only make sense that Jesus, being benevolent, would take the man’s hand and welcome him to the team. Yet, Jesus did the opposite. Aha. This says something to us. Wait a second here. This man has no theological training, no idea of what “evangelism” might look like. All he knows is that Jesus is the son of God (thanks, demons, for pointing this out), and that Jesus calls himself “lord;”a word having multiple meanings then, and even today. In short, this man had almost zero to work with. Oh, and he also had quite a checkered past, if we count the small matter of a gazillion demons. Sometimes, we get caught in the lie that we aren’t smart enough, that we don’t know the best wording to communicate a message of hope, or that we need extensive training before we can effectively connect people with the hope we know. Training is wonderful. A strong understanding of what we believe is worth pursuing. But if we keep waiting for more learning or more training, we will eventually tell ourselves we’ll only share our faith “When Pigs Fly.” Well, pigs do fly. And the flight of pigs opened the door for a man to tell his story. But look what he shared: His story. That’s it, and apparently his story–short as it was–was more than enough to convince a lot of people to change their thinking about Jesus. I don’t need to know everything. I don’t need the right words, the right theological constructs and I don’t even need some tried and true method to help someone take the next step of faith. All I need is my story. According to Jesus (who probably knows what he’s talking about) this is plenty. So perhaps the next time an opportunity to talk about my hope presents itself, I’ll begin . . . with a story.